As mentioned in my previous post, winter is a bitter sweet season. I appreciate the beauty of snow, but dislike the distress it leaves my skin in. I moisturize all through the year, but put in extra TLC for these cold and dry winter days. I have sensitive skin, and have to be extra careful in the products I use. Certain areas of my body tends to me more sensitive than others areas. I currently have two favorite products I use and it all starts in the shower. 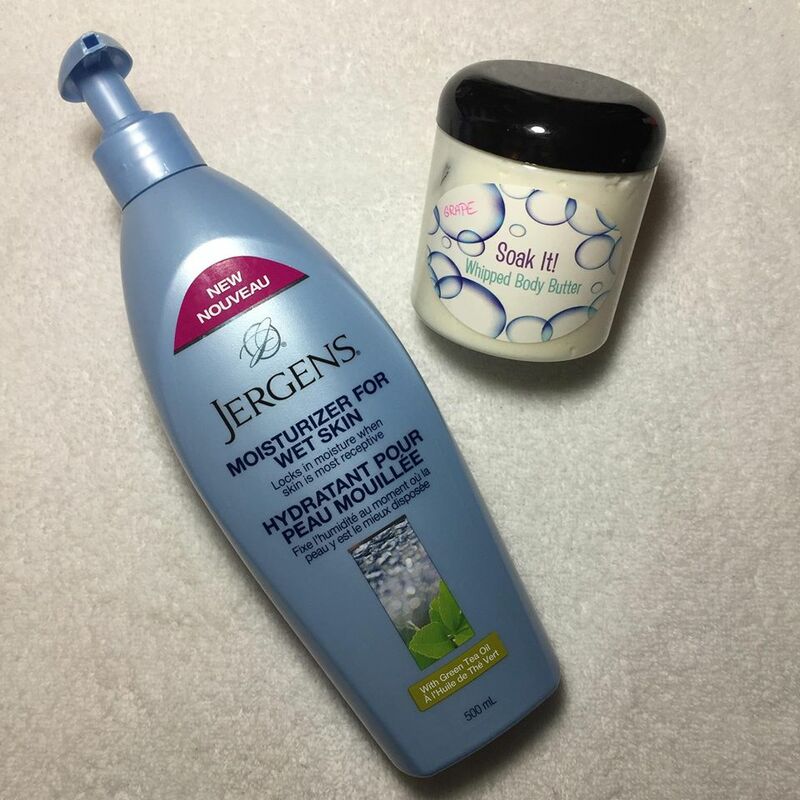 I recently discovered Jergens moisturizer for wet skin, and quickly fell in love. It locks in moisture when skin is most receptive, and it really does just that! It's an oil infused moisturizer for wet skin, as it blends with water on wet skin to instantly lock in moisture. Claims skin will look 2X more luminous straight out the shower, so you can be ready faster. I've been using for this for several months, and am a firm believer of its claims. Directions: After showering, but before drying off, apply to wet skin. Use a dim-size amount on each arm and a quarter-size amount on each leg. No need to rinse off. Simply pat dry and you're ready to go with instantly luminous skin. Being winter, I shower every other day and this leaves my skin completely hydrated until my next shower. It really does lock in moisture, and has been a holy grail for me. If I'm in a rush, I'll just stop at this step. For days when I have time for that extra step to pamper, I love to incorporate a body butter. This isn't drugstore, as its handmade from a cruelty free indie line called Soak it. Refer to previous blog post, for how I use her products to nourish my dry cuticles which can be found HERE. This whipped body butter is infused with a luxurious blend of ingredients, and leaves the skin feel silky without being greasy. This stuff is super fluffy, and is available in different scent options. I have the grape scent, because I'm obsessed with all her grape scented products. This whipped body butter also double as a great hand cream! It works lovely on my super sensitive eczema ridden hands.